Many commercial property “overhead expenses” are located literally over your head. 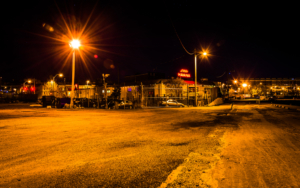 Parking lot lights may be eating up a significant portion of your budget. Having lights in a parking lot at night is necessary. You can’t do away with them, but you can tweak them. LED parking lot lights last longer and shine brighter. Lighting costs may seem high at first. The benefits come when you will need fewer replacements and pay lower maintenance costs. LED lights use almost 80% less energy than HID fixtures. Therefore, your lights may need only occasional cleaning, rather than a frequent replacement. As HID lights wear out, security is compromised. Hence the long-term cost savings with LEDs are substantial. Ever had to shield your eyes from the glare of a parking lot at night? LED lights have a cooler, more dispersed glow. HID fixtures may have a harsh glare and a pink hue after extended use. LED lights employ uniform beam patterns for proper brightness while using the same lumen used as HID lights. LED lights are virtually non-toxic. The construction of a typical HID lamp includes tungsten electrodes, gas and mineral salts. The gas passes through electrodes with the help of mercury. As a result, the bursting of one of these bulbs leaks hazardous waste. A qualified LED contractor will properly dispose of your old, toxic bulbs. Your new LED lights will have none of these toxins. In addition, LEDs do not emit UV radiation. Cost-saving, efficient and good for the environment? 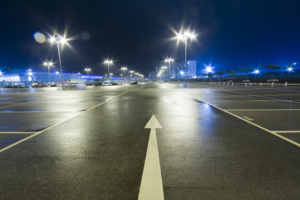 Make 2017 your year to start saving with LED parking lot lights. Our experienced team at NCLED has expertise to find the most affordable and efficient ways to help transition your property to LED. Let’s start with a complimentary lighting audit. Give our team a call at 920-455-8338.